Read our full review of the new Canon EOS 800D Digital SLR with built-in guide mode, and faster continuous shooting. 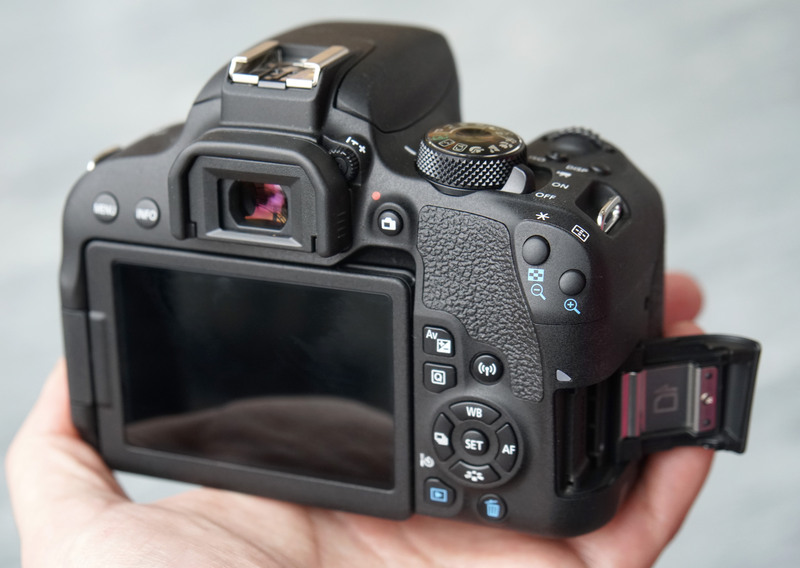 The Canon EOS 800D is Canon's update to the 750D. The camera features a new 24mp APS-C CMOS sensor, ISO25600 that extends to ISO51200, 6fps continuous shooting, FullHD 60fps video recording, along with built-in Wi-Fi, NFC, and Bluetooth. The 750D will remain on the market. Introduced with the 77D and 800D is a new Canon EF-S 18-55mm f/4-5.6 IS STM lens, an ultra-compact kit lens, that Canon say is the World's smallest non-retractable kit lens. The lens offers up to 4-stops of Image Stabilisation (IS), with improved optics, and a size that is just 61.8mm long. When used with the new lens, the camera is said to offer the World's fastest focus for APS-C ILC cameras at 0.03s (when using the viewfinder). The new lens will also be available on its own, as well as part of a kit. Nb. 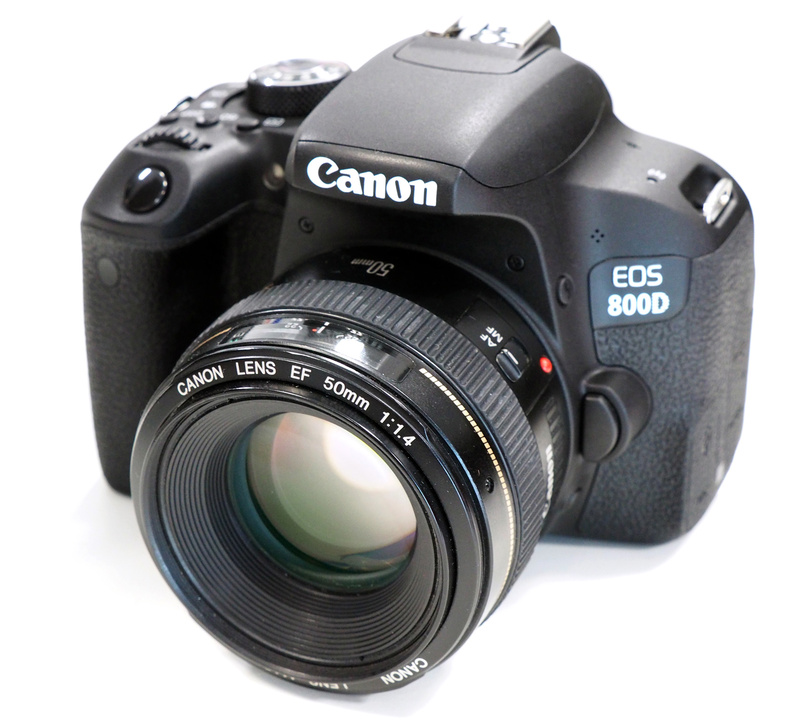 The Canon EOS 800D is also known as the Canon Rebel T7i (outside Europe), and the Canon KISS X9i in Japan. At first glance, the Canon EOS 800D may appear quite similar to the previous camera, the 750D, but when we look at the specifications in more detail, we can see that a number of improvements have been made. 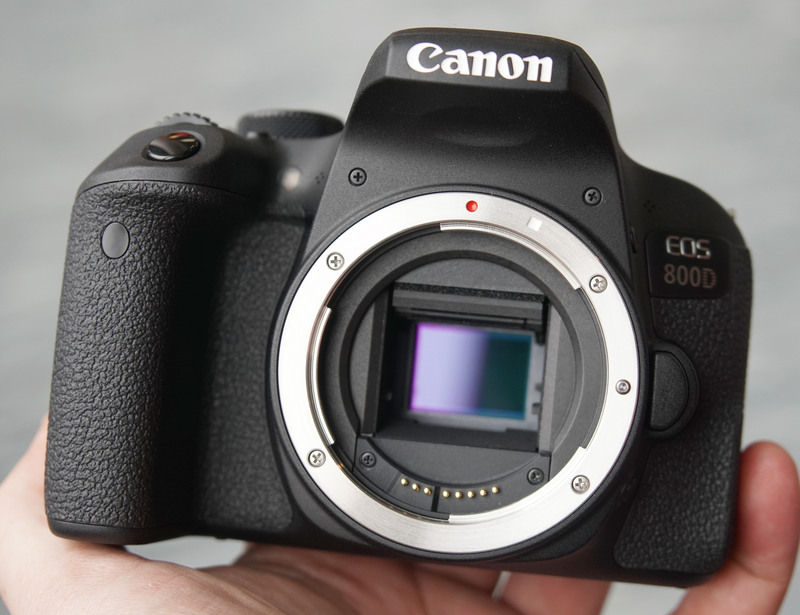 The updates to the Canon EOS 800D, with a new user interface, and new connection button, with built-in Bluetooth makes the camera easier to use for beginners, as well as being more appealing to a younger generation, whilst the other improvements made to the camera make this more appealing to the more enthusiastic photographer. 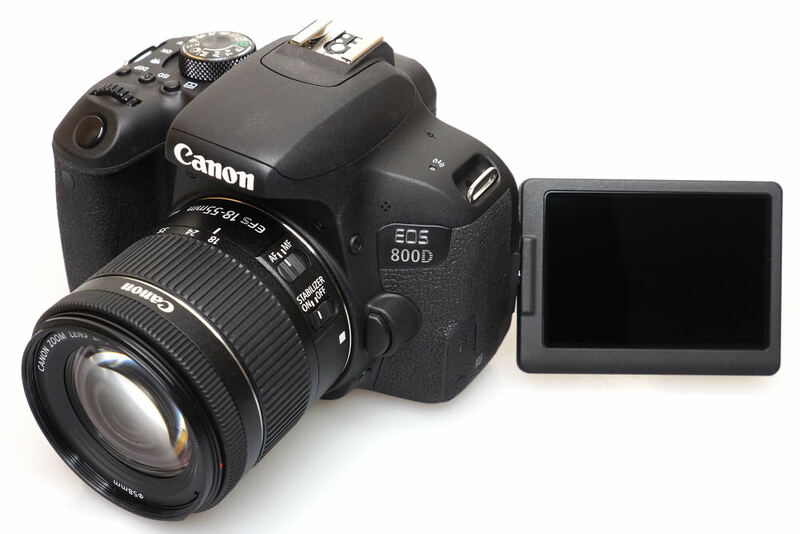 The Canon EOS 800D is the Canon EOS DSLR camera for all – beginners and enthusiasts. Wi-Fi is built-in and the camera includes NFC for quick connections, and Bluetooth is also available for low-power image transfers. 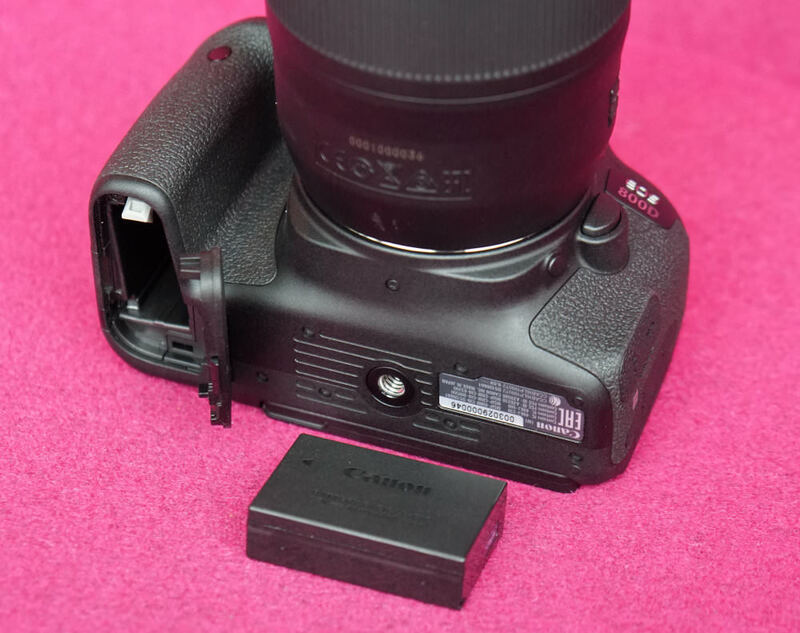 There is a microphone socket on the side, a flash hot-shoe on top, plus a built-in pop-up flash. The 3inch vari-angle touch-screen can be tilted forwards so that it can be used as a selfie screen, and the built-in guide can be switched on and off. FullHD video is recorded at 60fps, with stereo sound. Electronic image stabilisation helps keep images steady, or you can use a lens with built-in optical image stabilisation (OIS). A new Bluetooth remote, BR-E1, has been introduced, offering a separate AF button and shutter button, letting you remotely control the 77D or 800D. The remote is not currently compatible with any other Canon cameras, and has a 5m+ range. 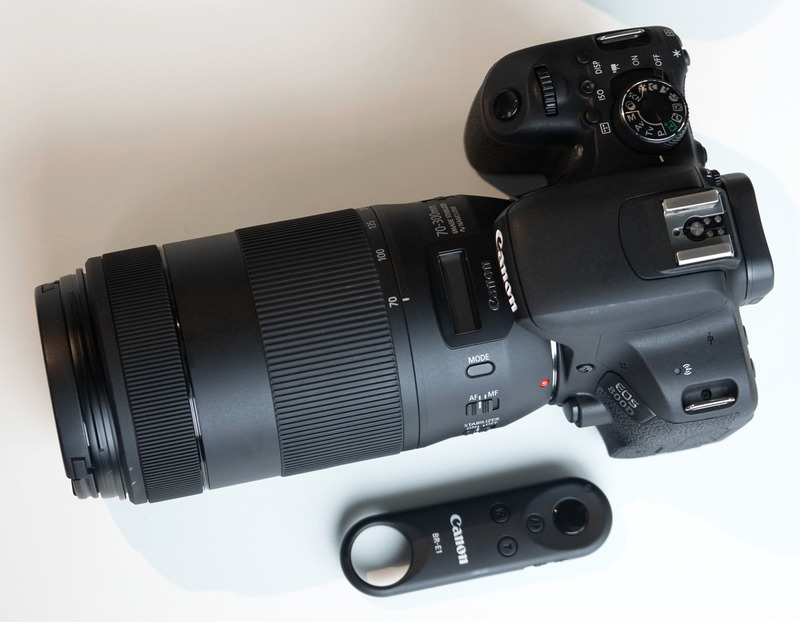 The Canon EOS 750D is shown above, next to the new Canon EOS 800D. Compared to the previous version(s) of this camera, there is a much deeper grip, with a thinner body, making it feel excellent in the hand. Going back to the previous version is somewhat of an anti-climax. The camera has a plastic construction, however, this shouldn’t put you off the camera, with the camera feeling and looking solidly built. As testament to this, there are many older models still going strong today. 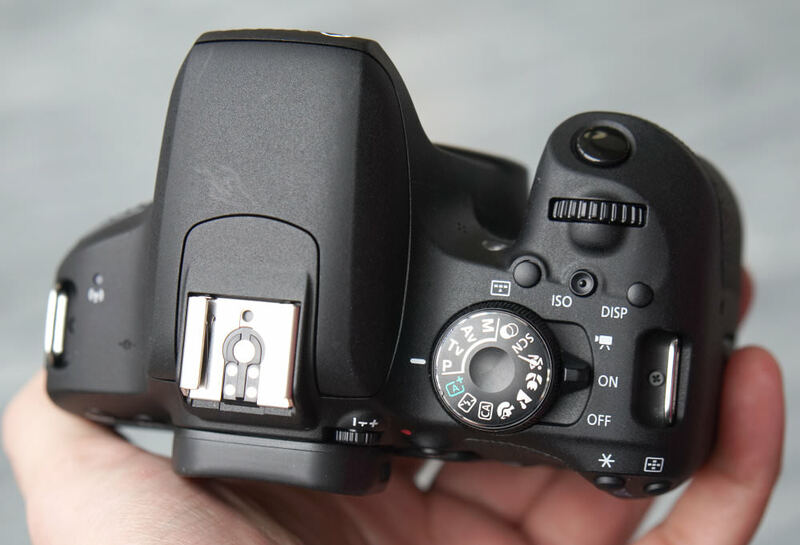 If you’re moving from a previous EOS camera, then the layout of buttons and controls will be very familiar, with the main difference being the addition of a “connection” button. The on/off switch also features a third position, which switches the camera into video mode. Unfortunately there is only one control dial/wheel, on top of the camera, which means you need to press the AV button when shooting in manual mode in order to swtch between changing the aperture and shutter speed. It’s unfortunate that Canon doesn’t use a scroll wheel around the 4-way controller at the back or provide a rear command dial. (As they have done on some Canon Powershot and EOS M cameras). The screen looks good, although the live-view refresh speed isn’t as quick as most mirrorless cameras, with a 30fps refresh rate. Using the touch-screen to change settings is easy, and the screen is very responsive to touch. Viewing angles are good, with a gapless screen, and being able to tilt the screen can make it easier to see what you are shooting. 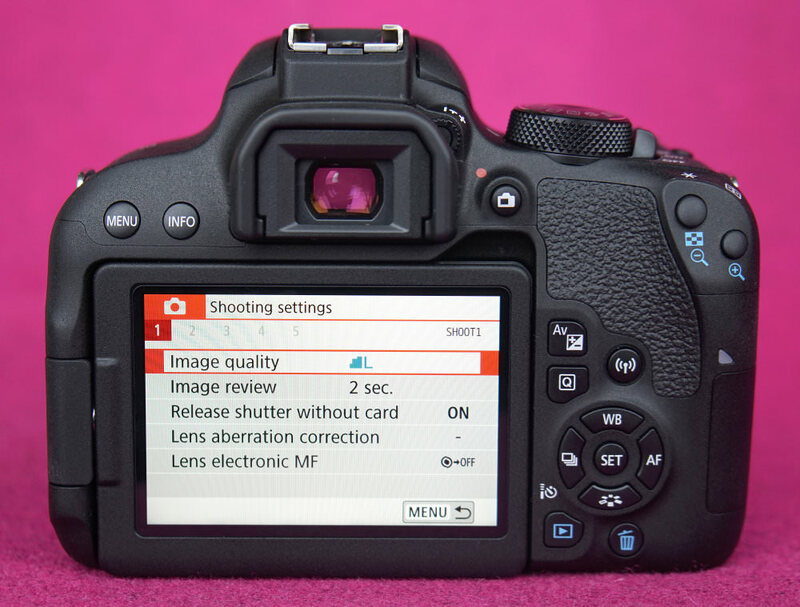 There are now 45 focus points (with 49 available in live-view), and these can be viewed in the optical viewfinder when shooting, or on the rear screen when using live view. You can even switch on display of focus points in playback mode, so that you can confirm you focused on the desired point(s). In live-view the focus area covers a large area of the image, and there is no penalty in focus speeds. The optical viewfinder, whilst not the largest, features dioptre correction, and there is a soft rubber surround, making it comfortable to use both with or without glasses. Menus - The new guided menu system can quite easily be switched off if you’re already used to Canon’s menu systems. If you’re not, the guided menu system is clear and easy to use, with brighter text and larger icons. If you go for the standard menu system, this is clear and well laid out, and you can use the touch-screen with both menu systems. The Q button give quick access to settings, and these can also be changed with the touch-screen. The only interface that we’d like to see updated is the live view mode, where pressing the Q button brings up another method to change settings. Wi-Fi features - Setting up a connection to your smartphone or tablet is relatively easy. As the app, Canon Camera Connect, guides you through the process making it as easy as possible for you. Once setup, it’s easy to transfer images over, as well as remotely control the camera. You can also use the app to add location information to your photos. Battery life - Battery life is rated at 600 shots according to Canon / CIPA test results, which is very good and an improvement over the 440 shots possible on the 750D. This should save you money, as you're less likely to need to invest in a second battery. Hi, Canon user for many years. Why do Canon persist with the APS-C sensors? surley a FF sensor is now the way to go, I just wonder what people would say if offered a new APS-C sensor or an older sensor in the new body that offers the advantage of FF. Yes I no APS-C sensors are cheaper to make but anyone no the difference in cost between the APS-C and the FF sensor in manufacture? [quote]Why do Canon persist with the APS-C sensors? surley a FF sensor is now the way to go,[/quote] Strange question. They make a range of FF and APSC cameras. Who benefits if they stop APSC? Strange question. They make a range of FF and APSC cameras. Who benefits if they stop APSC? Quote:Hi, Canon user for many years. You do know that every manufacturer sells way more crop sensor DSLRs than FF cameras don't you. Just because you seem not to need/want the benefits of a crop sensor camera doesn't mean that FF is for everyone. And the sales numbers seem to back this up. "Surley" a good job there is choice eh! “Why do Canon persist with the APS-C sensors?” You might as well ask why do Canon use FFsensors? There’s a market for both. Personally I find 24MP APS-C gives me what I need. So why would I want bigger, heavier, and more expensive? Go one model up from entry level and you’ll get most of the extras too. Consumers want choices. Interestingly, Fujifilm chose to skip the FF market, and jump from APS-C to Medium Format for those that want better quality. All formats are compromises. There’s no perfect choice. “Why do Canon persist with the APS-C sensors?” You might as well ask why do Canon use FFsensors? There’s a market for both. Personally I find 24MP APS-C gives me what I need. So why would I want bigger, heavier, and more expensive? Go one model up from entry level and you’ll get most of the extras too. Consumers want choices. Interestingly, Fujifilm chose to skip the FF market, and jump from APS-C to Medium Format for those that want better quality. All formats are compromises. There’s no perfect choice. [quote]Hi, Canon user for many years. Why do Canon persist with the APS-C sensors? surely a FF sensor is now the way to go, I just wonder what people would say if offered a new APS-C sensor or an older sensor in the new body that offers the advantage of FF. Yes I no APS-C sensors are cheaper to make but anyone no the difference in cost between the APS-C and the FF sensor in manufacture? Russ[/quote] Personally I am not interested in FF. If I were to buy an FF camera I would need a complete new collection of lenses, which would put even a low-priced DSLR way beyond my budget. Canon are obviously aware of the need to cater properly for their existing customer base. Why do Canon persist with the APS-C sensors? surely a FF sensor is now the way to go, I just wonder what people would say if offered a new APS-C sensor or an older sensor in the new body that offers the advantage of FF. Personally I am not interested in FF. If I were to buy an FF camera I would need a complete new collection of lenses, which would put even a low-priced DSLR way beyond my budget. Canon are obviously aware of the need to cater properly for their existing customer base. For those who do not have a seriously RAM loaded computer, working with Full Frame image files would be nearly impossible. The file sizes on my full frame camera are in RAW over 90 megapixels! It makes neither sense nor is it practical to eliminate a perfectly viable smaller sensor which is overkill for the caste numbers of photo users who are just as likely to use their smart phone to take pictures otherwise. I have both formats, full and APSc and use them both. They each have advantages. When I first obtained an APSc I thought it was a dead end and eventually all digital cameras would head to a full frame when prices dropped which they never did. The APSc became the popular standard for SLRs and the full frame strictly for professional use. It makes sense. Surely 24 megapixels is more than sufficient for general use and makes for decent print sizes for nearly all uses. They get better and better. The format war so to speak is done and APSc is the winner and now with Canon finally adding electronic Image stabilization they have all the advantages of the tiny compromised sub APS c formats as well. Mirrorless might be the next step of course for those that choose that but in principle the sensor issue is the big one and not mirror vs no mirror. There are millions of lenses out there and people are not about to toss them for yet a new format. I suggest more to the point is a set of FAST Focussing lens adapters for mirrorless cameras. That would be excellent for all that glass out there. For those who do not have a seriously RAM loaded computer, working with Full Frame image files would be nearly impossible. The file sizes on my full frame camera are in RAW over 90 megapixels! It makes neither sense nor is it practical to eliminate a perfectly viable smaller sensor which is overkill for the caste numbers of photo users who are just as likely to use their smart phone to take pictures otherwise. I have both formats, full and APSc and use them both. They each have advantages. When I first obtained an APSc I thought it was a dead end and eventually all digital cameras would head to a full frame when prices dropped which they never did. The APSc became the popular standard for SLRs and the full frame strictly for professional use. It makes sense. Surely 24 megapixels is more than sufficient for general use and makes for decent print sizes for nearly all uses. They get better and better. The format war so to speak is done and APSc is the winner and now with Canon finally adding electronic Image stabilization they have all the advantages of the tiny compromised sub APS c formats as well. Mirrorless might be the next step of course for those that choose that but in principle the sensor issue is the big one and not mirror vs no mirror. There are millions of lenses out there and people are not about to toss them for yet a new format. I suggest more to the point is a set of FAST Focussing lens adapters for mirrorless cameras. That would be excellent for all that glass out there. According to pro Ken R, these smaller sensors today are so good that unless you're a pro blowing up to mural size.. you won't see the diff. In any case, having finally just gone from Fuji Velvia/Leica to digital.. it made much sense to get the smaller sensor camera. For the same price as just the body of the Canon 800D, I picked up a mint camera and with it.... a fixed 24.f2/8-1600 f4 Leica optic!! It's the Lumix FZ1000. Results are stunning, close to velvia 50, with setting at Vivid X5 and an 81B filter..